Why was Chip And Joanna Gaines’ “Fixer Upper” such a massively successful show? Well, of course the rustic dream houses brought to life before our eyes were the main attraction, but the Christian couple’s incredible sense of humor—which has apparently not skipped a generation in their family—was a bonus. Enjoy? Excuse me, I mean die laughing. And then, you notice it. The letters, what they spell out. Swallow your coffee first so you don’t spit it out from laughing! The delightfully DIY sign is likely most often used to spell out sweet or inspiring messages such as “Gather here with thankful hearts,” a nod to Acts 2:46. Honestly, knowing her family’s Bart Simpson-esque tendencies to play fun pranks, Joanna was probably not surprised at all by the sign. 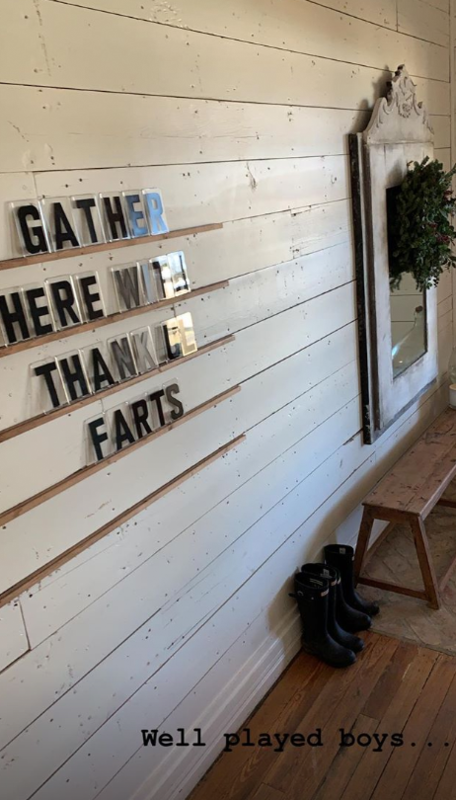 In fact, previous Instagram posts show the creative sign being humorously used to support her after the launch of her latest home decor book, “Homebody”.